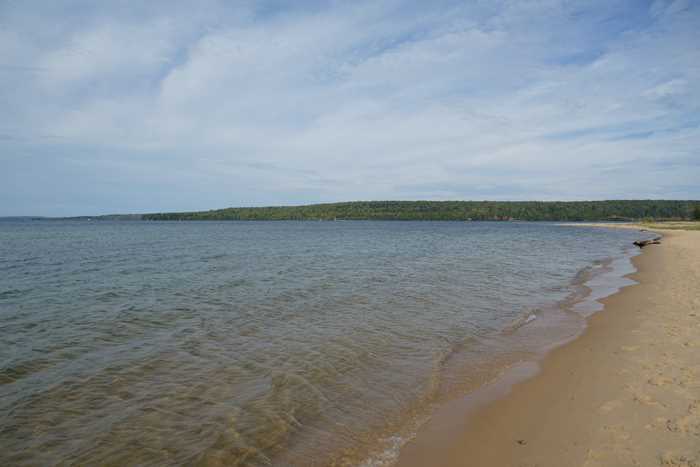 Pictured Rocks National Lakeshore was never on my radar until I started researching the Upper Peninsula. Even then, I didn’t expect a lot as I drove over for the day from Marquette to check it out. What I found was a big park, administered by the National Park Service, that deserves much more than just one day to explore. I did the best with the time that I had, starting with a visit to beautiful Munising Falls and nearby Sand Point Beach. Pictured Rocks National Lakeshore is located on the Lake Superior coast, in between the towns of Munising and Grand Marais. 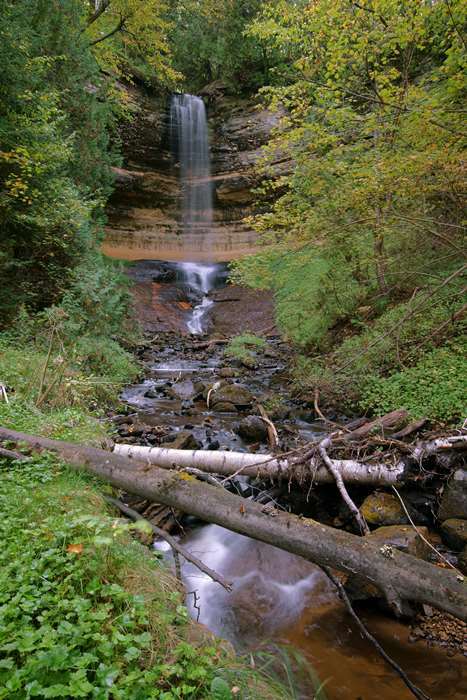 If you’re coming from Marquette, it’s about a 45 mile drive on M-28 to the Munising Falls Visitor Center. Coming from Interstate 75, you’ll also take M-28, then M-77, to the Grand Marais Visitor Center, about 100 miles. 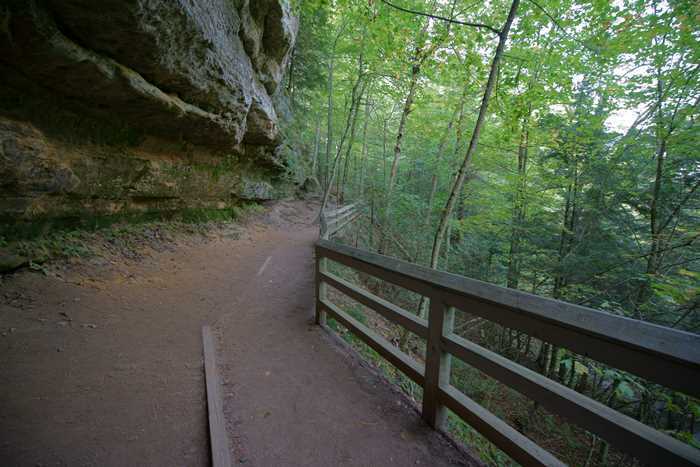 In between Munising and Grand Marais, Adams Trail, route H-58, runs inland, and side-roads provide access to many of the park’s destinations. 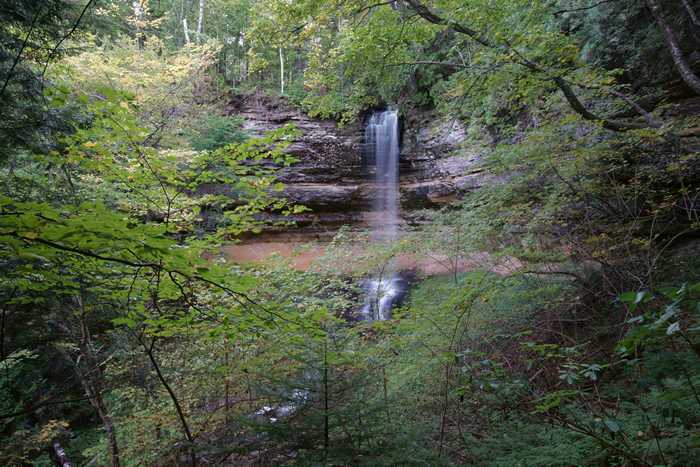 To access Munising Falls, follow Munising Avenue to Washington Street, and stay right as you pass the hospital. The trailhead for the falls is at the visitor center. Keep driving to the end of the road for Sand Point Beach. Pictured Rocks National Lakeshore is filled with beautiful waterfalls that are worth visiting. Fortunately, the first one you’ll encounter (assuming you’re arriving on the west side of the park, as I was) is just a short 800-foot walk up an easy path from the visitor center. Munising Falls is perfectly framed by trees, as Munising Creek tumbles over a sandstone cliff, with a drop of about 50 feet. Look closely, and you can see just a tinge of yellow in those green leaves. My visit, during the first week of October, was just a few days too early to catch the peak of fall color in this area. … at another viewpoint for Munising Falls, this one slightly higher, with a different angle, but still nicely framed by the trees. Indeed, there is a nice, sandy beach here. But, it was pretty late in the season to think about swimming. There was a cool breeze blowing off the water, and I was the only person braving the waterfront. Look across the water, and you’ll see Grand Island. That building on the coast that looks like a picturesque church is actually East Channel Lighthouse, built in 1868 and decommissioned in either 1908 or 1913, depending on which source you believe. You can’t visit the lighthouse directly, but you can photograph it from various boat tours that pass by. You can, however, take a ferry over to Grand Island, and then explore the island by either a bus tour or by bicycle. 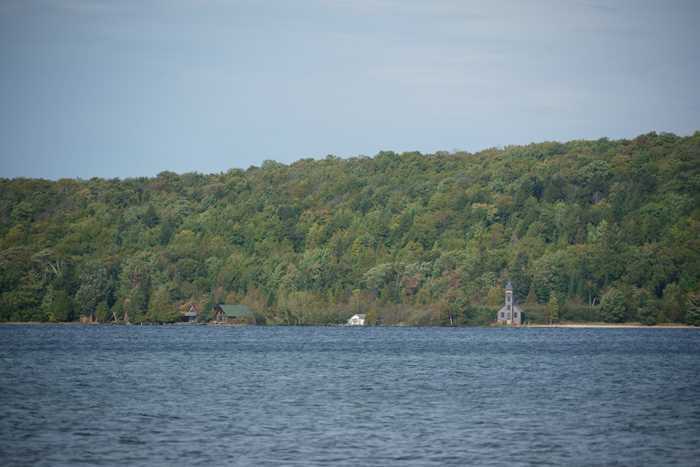 The Grand Island Ferry departs from M-28, west of Munising. Adult ferry tickets cost $15, which includes a $2 National Forest use fee. Once you’ve visited Munising Falls and Sand Point Beach, you’ve just barely scratched the surface of what Pictured Rocks has to offer. Backtrack to H-58, then head east. Munising Falls is easy to access and quite beautiful. You should definitely make it your first stop when entering the park. A drive out to Sand Point Beach is optional, but it is worthwhile just to see the old East Channel Lighthouse across the water on Grand Island.